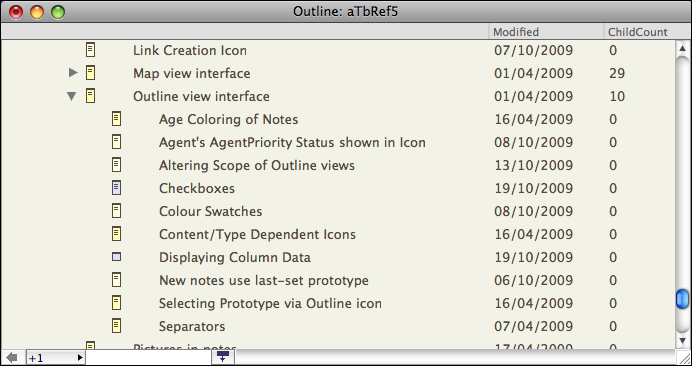 Outline views have a (non-default) option to display attribute data in columns to the right of the note titles. This feature is enabled via the View menu. There is no document level preference for this setting as each discrete Outline view window has its own column visibility state. As with $Name, any editable attribute value can be edited via Edit-in-Place. Column data is drawn in the source note's $Color, and the current row of data is highlighted (as with the actual note title). With Edit-inPlace turned on (the default) column data - for any non read-only (i.e. most) attributes - can be edited in place. As with the normal note title edit, click and hold to enter edit mode. a new column to be added. Deleting a column has no effect on the data it was displaying. There is no set limit to the number of columns that can be displayed - the view will support columns displayed off-screen though there is little point in this. If all columns are deleted, Column view is turned off. Separators still draw normally and therefore do not display column data. Adding more columns will shrink the width of existing columns rather than grow the view window. Dragging the view window wider after adding columns doesn't re-expand the columns, so if planning to use use multiple columns it is a good idea to re-size the view window first. Each open window showing an Outline view will remember the columns used (such data is stored per view). However, on closing a view with columns any column customisation is not retained. This is because the column view setting is stored in relation to the window showing the view and not as an attribute of the view's current root container, as might be intuited; this settings data is also not user-editable - it's stored internally in the TBX file. Thus when a window showing columns is closed, its data is discarded. Any window showing Outline view with columns that is open when a TBX is saved & closed will be remembered and restored when the file is next opened. Column widths can be auto-configured by double-clicking the divider at the right of each column; the column width is set to the widest data entry or the column's header title, if longer. For very large values, e.g. long runs of text, a double-click width resize may not expose the whole text, though the column can still be dragged wider. Column widths may also be altered by manually dragging the right-side divider bar of the column's header. The left-right order of columns can be altered by clicking on a column heading (away from its edges) and dragging left or right. There are some limitations to column manipulation. Column data does not wrap if wider than the current column, the data is simply only shown in part (with nothing to indicate more text). From v5.9.0, Boolean attributes are displayed as tick-boxes. From v5.10.1, double-clicking a displayed column value allows a value to be edited (or entered finto a blank 'cell'). Double-clicking the first ($Name) column continues to open the note's text window as previously.